This website was created by Mirova. 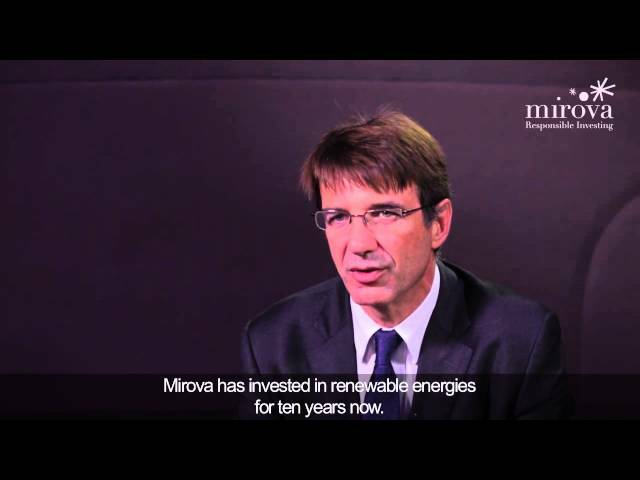 It is managed and updated by Mirova. Registered office: 59 avenue Pierre Mendès France - 75013 Paris. Chief editor: Philippe Zaouati, Chief Executive Officer. Mirova reserves the right to change the information on this website at any time at its discretion and without notice. Mirova does everything in its power to ensure that the information published is as complete, correct, accurate, and up-to-date as possible. Mirova cannot be held responsible for any errors or inaccuracies on this site, or for any loss or damage resulting from the use of this information. However, if the published information appears to contain errors, or information expected to be found on this site is lacking, Mirova undertakes to remedy the situation as soon as possible after having been notified of such shortcomings. To notify us of any errors please contact: communication-mirova@mirova.com. By agreeing to consult this site you release Mirova from all responsibility now or in the future for any use you may make of this information. The information on this site is not meant for dissemination or to be used by any person or entity in a country or jurisdiction where this dissemination or use would contravene the law or regulations, or would oblige Mirova to comply with the regulation requirements in these countries or jurisdictions. The totality of products and services may not be registered or authorized in all countries or available to all clients. No information on this site constitutes an offer to buy, an offer to sell securities, investment advice regarding the purchase or sale of any security, or an offer or solicitation by Mirova to supply investment advice or financial, legal, fiscal, or investment services, or the buying or selling of securities or other financial instruments. Mirova do not gives any guarantee or makes any declaration, expressly or implicitly, that the information given on this site is accurate, complete, or up to date. Any investment in UCITs/AIF must be made only after having consulted the UCITs/AIF' simplified prospectus/key investor information document and the annual and six-monthly reports, if available. These documents may be obtained either from this website or directly from the company that manages the UCITs/AIF in question. Offers of products and services and advertising by third parties may be published on this website in the form of banners. By clicking on one of these banners you will be redirected to a third party’s website. Mirova accepts no responsibility for the content of advertising or the conditions that apply to offers from third parties. These are in fact displayed on behalf of these third parties. If you wish to subscribe to such an offer or enter into a contract with such a third party, and also if you wish to make a complaint about such offers or advertising, you should contact the third party directly. Mirova does all it can to ensure that there is no interruption to the availability of this website. However, it accepts no responsibility for any loss or damage suffered as a result of any interruptions – whether voluntary or involuntary – which may occur. Mirova does not offer any guarantee regarding the compatibility of the forms on this website with any infrastructure or with your material. As a user, you must ensure that you have the appropriate computer equipment as well as the necessary software, including security software (firewall and anti-virus). The user expressly acknowledges that the information and data made available to him/her are and remain the property of Mirova or its partners, as stated on the website. Text, designs, photographs, images, data, company and domain names, brands, logos, and other elements are protected by intellectual property rights. No one may reproduce these or disseminate them in the public domain without prior authorization in writing from Mirova Environment and Infrastructure, except where laws on authors’ rights and related rights stipulate otherwise. As a user you have, for example, the right to download information from this website and reproduce it for private use, and disseminate it among family members free of charge. If Mirova allows you to put your own contributions or images on the website, you may not submit material that is protected by intellectual property rights, unless you yourself hold these rights or have been given the necessary authorization by the holders of those rights to place the material on the website. By placing your contributions or your own photographs on the website, you expressly confer on Mirova the right to publish these contributions or photographs on the website, without having any claim to payment. In any event, the user fully safeguards Mirova against any claims by third parties. This website may contain links to the websites of third parties. These links are placed on this website only for information. Mirova does not offer any guarantee as to the content, quality, or comprehensiveness of such websites and, consequently, cannot be held responsible for them. The presence of a link to a third-party website does not mean that Mirova has made any agreement to collaborate with the third party, or that Mirova approves of the information published on such a website. e. use this website to send or transmit promotional material or advertising. By browsing the http://www.mirova.com website, one or more cookies may be stored on your computer, mobile phone or tablet. This section helps you better understand how cookies work and how to set your internet browsers to manage them well. Cookies from http://www.mirova.com (first-party cookies): Our website stores these cookies on your device in order to meet browsing and optimisation needs for our website. Required cookies and cookies that improve your browsing experience: These cookies are required for the functioning of the website and are set by http://www.mirova.com. They enable you to use the main features of the site (e.g. session cookies, language preference cookies). They record information about your browsing on the website using the computer on which the cookies are stored and are not kept for more than one month. You may freely visit this website and consult the information on the organization and services of Mirova without having to provide any personal data in order to do so. Only the subscription service offered by this website requires personal data to be entered. Each time you communicate personal data, Mirova will handle these in accordance with the policy set out below, and with its legal obligations on handling personal data. Personal data are recorded in a secure environment which is not open to the public. They are handled only for internal purposes (client management, etc.). Mirova uses the personal data it collects to make contact with you and to offer you the best possible service. These data are not retained for longer than is necessary to provide the service, or use the function, in question. Mirova generally does not pass on these personal data to third parties, except to fulfill legal obligations and in the event of a request from the courts or the police. If, exceptionally, Mirova were to pass on personal data to organizations or companies with which it works, you will be expressly informed or asked to give your express consent. A user who provides his/her personal data expressly authorizes Mriova to handle them to achieve the goals given above. In accordance with articles 39 and following of law no. 78-17 of 6 January 1978, amended in 2004, regarding information technology, files, and personal freedom, any person may request communication, and, if applicable., correction or deletion of their data concerning them, by emailing: communication-mirova@mirova.com. You may need to use a password to access certain parts of the website. In that event, access to those parts without using a password is strictly prohibited. If you have received such a password, this must remain confidential and secret. Any use of our services after valid identification using your password will be taken to be by you. Mirova has the right to cancel your password if the website’s security is threatened. Except in the event that it is seriously at fault or negligent, and can be demonstrated to have caused loss or damage as a result, Mirova cannot be held responsible for any loss or damage that may result from using this website or the information on it or obtainable through it (notably via links). Mriova can also not be held responsible for any loss or damage resulting from technical failure, interruptions to access to the website, or any problems with your computer or software. Mirova cannot be held responsible for any loss or damage due to viruses, bugs, Trojan horses, etc. that appear on the website despite the precautions taken.